This is one of the more attractive apartment buildings along this handsome boulevard. It is distinguished by large, green, glazed terracotta shields along its roofline and very bold and unusual balconies that have limestone ends and wrought-iron railings. The brown-brick building has a three-story limestone base and a very ornate top with a large limestone balustraded bandcourse two floors from the top. It was erected in 1910 and converted to a cooperative in 1978. It was designed by Schwartz & Gross and is arranged around an interior court that opens to the east. 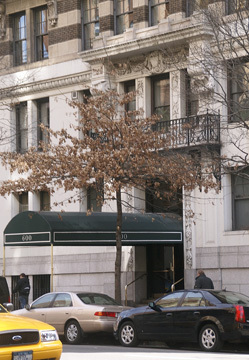 The transitional third story is faced in brown brick banded with contrasting white stone and the transitional tenth story is enhanced by terracotta brackets supporting a continuous balustrade at the 11th floor. 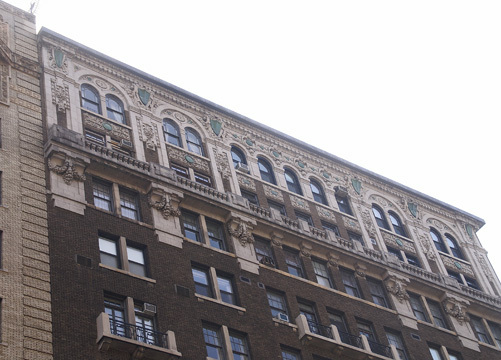 The richly decorated top two floors have terracotta spandrels with green plaques and arched openings at the 12th story with the paired end bays set in inscribed arches recalling Gothic tracery. The large green terracotta shields are topped by a dentiled terracotta cornice and a parapet wall. Almost every floor has vents cut into the facade and few of the oiriginal windows have survived. 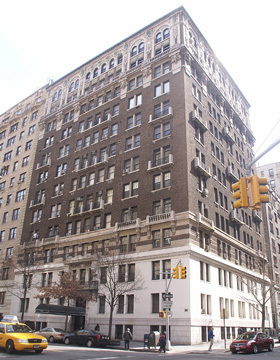 The 13-story building has 68 apartments and a step-up entrance and protruding air-conditioners. The building permits protruding air-conditioners and has inconsistent fenestration and no sidewalk landscaping, no health club and no garage.